‘All on 4’ supports a Full Arch Restoration on only 4 implants, and can reduce the need for surgical interventions such as bone grafting and sinus lifts. It is a popular choice for patients and our dentists. Because of the status of Nobel Biocare as one of the world’s leading Implant companies, we get the benefit of their extensive research, testing and experience, which makes it a very safe and highly functional option. This system can support ‘immediate’ loading, so we can deliver ‘teeth in a day’, which is one of the most satisfying things for both patient and dentist! As ever, we don’t believe that one solution fits all, and not everyone needs this level of technology, but we are very happy to offer it as part of our portfolio of Implant Treatments. At Winning Smiles we operate an in house digital CT Scanner for 3d imaging, essential when planning to place implants. The degree and angle of bone need to be seen millimetre by millimetre. Our objective, and minimise the number of implants required where possible by creating a firm foundation and to preserve the usable bone for the future. See “how many implants do I need“. The major benefit of the precision, is that we can be confident in offering implant treatment in what might be considered difficult cases, without risk. 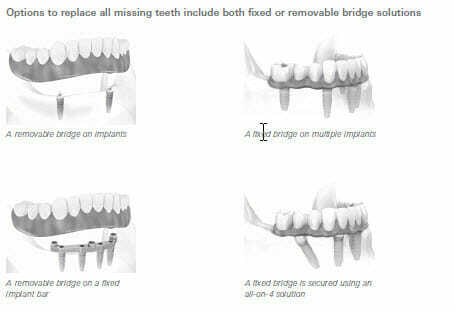 The following costs for All on 4 Implant System are correct when written, but they can change. We will provide written pricing for each ‘cosmetic treatment’ as part of our free consultation.You don’t have to be a member to have treatment at Winning Smiles.